Implementation of all activities of the NeWater project in work blocks and their interaction. 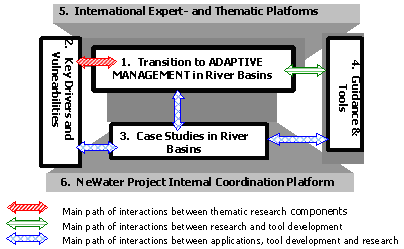 WB1 developed new concepts and methods to understand and implement the transition from current practices to more adaptive management to increase the adaptive capacity of river basins. It will include a critical evaluation of costs and benefits and of potential risks associated with such a transition. WB 1 integrated results and tools from WB2 that investigated vulnerabilities and adaptive capacity of river basins and developed practical toolkits to set the baseline for understanding the priorities to be addressed by adaptive management strategies. Both WB 1 and WB2 performed empirical research in case studies coordinated by WB3. WB3 carried out stakeholder processes and coordinated empirical research in the selected river basins to generate input to the development of new concepts and methodologies and to provide a test bed for their plausibility and applicability under different environmental and societal conditions. WB4 further developed tools and guidance for practitioners based on new conceptual insights, experience collected in the basins and the needs from ongoing policy processes, in particular the European Water Framework Directive and the European Water Initiative. Research activities and the development of guidance for practitioners paide high attention to integrate results from previous and ongoing EU projects and to engage in an intensive dialogue with the wider community of IWRM experts. WB5 established the link to relevant European activities and ongoing policy processes. The platforms provided immediate feedback from and to policy processes, in particular to the implementation of the European Framework Directive and the European Water Initiative. NeWater was a complex project that requires very good coordination and management. WB6 established a platform to coordinate the project. Interaction will be facilitated between stakeholder and problem driven processes in the basins and thematic research. The management approach chosen will be adaptive and flexible to guarantee the ability to respond to challenges arising from stakeholder interactions and new insights gained during the project.